I have attached for your information and review an updated presentation “Portfolio Advisory Services for Equity & Senior Lenders” from Gerbsman Partners. Also, below is a video taped presentation on “Corporate Governance”, “Early Warning Signs” and “Maximizing Value” for under-performing/distressed venture backed Intellectual Property companies that I presented at Stanford University. This video will be used in the Stanford Engineering School via STVP (Stanford Technology Ventures Program) and SCPD (Stanford Center for Professional Development). Aside from Gerbsman Partners core business of maximizing value utilizing its proprietary “Date Certain M&A Process”, Gerbsman Partners has been assisting equity and senior lenders “Identifying the Early Warning Signs & Maximizing Value for Underperforming and Distressed Portfolio companies”. Gerbsman Partners has been engaged by numerous equity groups and senior lenders to perform a “business audit” and provide observations, recommendations and an action plan for maximizing value. Typically this is a 1-2 day on site review at the portfolio company and a written and in person review with equity or the senior lender. If Gerbsman Partners is retained to perform Crisis Management and/or “Date Certain M&A” services for the portfolio company, Gerbsman Partners will credit 50% of the business audit’s fee’s to any future engagement. By background, since 2001, Gerbsman Partners has focused and been involved in maximizing enterprise and Intellectual Property value for 91 venture capital/private equity backed and /or senior lender financed, technology (software, mobile, telecom, optical networking, internet, digital commerce, cyber-security, etc. ), life science, medical device, solar, fuel cell and low tech companies through Gerbsman Partners proprietary “Date Certain M&A Process”. Gerbsman Partners has also terminated/restructured over $ 810 million of prohibitive real estate and equipment leases, sub-debt and creditor issues. Gerbsman Partners also assists US, European and Israeli technology, digital marketing, and medical device companies with strategic alliance development, M&A and licensing and distribution of proprietary content. Gerbsman Partners has offices and strategic alliances in San Francisco, Orange County, McLean, VA, New York City, Boston, Europe and Israel. 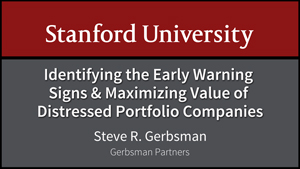 Identifying Early Warning Signs & Maximizing Value of Distressed Portfolio Companies – Presentation at Stanford University by Mr. Steven Gerbsman. I also was the moderator for a panel on the same subject that consisted of Marc Cadieux, Chief Credit Officer of Silicon Valley Bank, Peter Gilhuly, Esq., Partner at Latham & Watkins and Michael Scissions, Entrepreneur/CEO and former head of Facebook Canada. Please review and hopefully the information will assist in “Identifying the Early Warning Signs” and provide “food for thought”.